Pain is a part of life. I remember when I was still taking Philosophy classes, we had one discussion about the importance or if I may say, the role of "evil" in the process of defining "good". I'm sure no matter how comfortable or well-off a person is, no matter how content or tolerant one can be, pain is the inevitable feeling that comes with life--and that's not pessimism. It's just so. Recently I encountered Giga Ventures. I first saw them at Robinson's Galleria, then I also saw their stall at SM Megamall. They have numerous branches all over the Philippines but just in case you haven't heard about them, you can also find Giga Ventures online: their website here and their Facebook here. 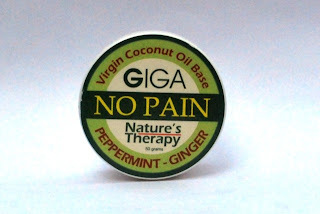 I tried some of their products and for this post let me share with you Giga Ventures' Therapy Balm called "No Pain". Compared to your usual Vicks, No Pain soars higher not only because it's an all-natural balm but also because its effect is long-lasting, very soothing sans the menthol sting. What I love about No Pain is it relieves you of pain in a very subtle way. It doesn't relax you just because of a menthol vapor, rather, it allows the peppermint-ginger oil mix to really be absorbed by the body, calm the senses and soothe stress. No Pain is a great balm for people who are prone to headaches or travel sickness--a must-have in your bag! It's also a great massage balm after a busy day. For more information, please do visit Giga Ventures online or at your favorite malls. Check out their great gift ideas here. Subscribe to this blog to know more about Giga Ventures Body and Hair Treatments, to be featured soon. pain is part of life indeed. I would be happy to have your support.